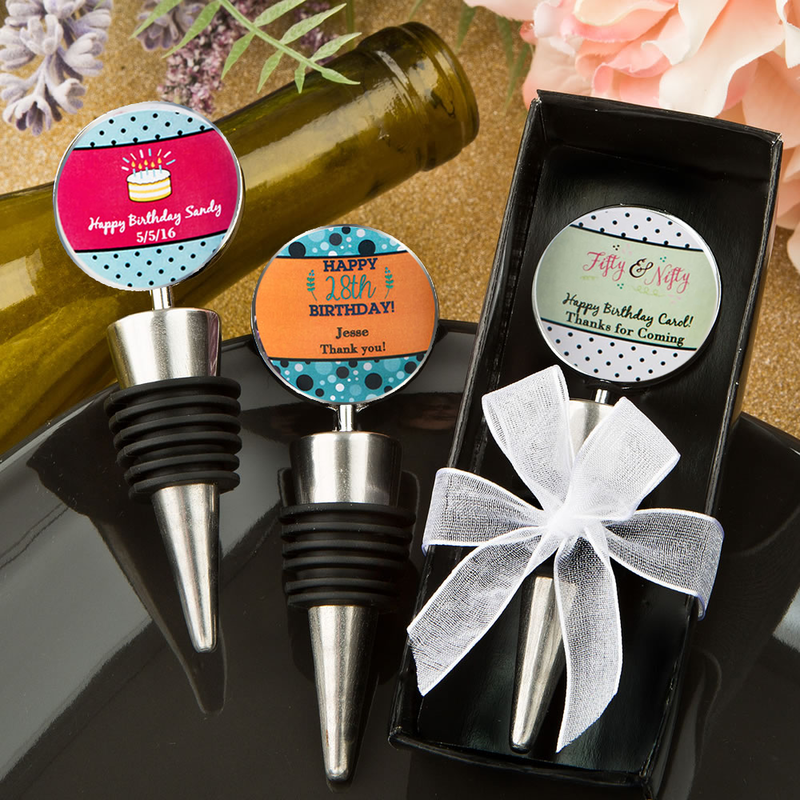 Custom bottle stoppers are one of the most original birthday party favor ideas around. That is because it is sturdy, useful, looks great on the tables, and features the guest of honor's name on the label. You can be sure that your party attendees will remember your important birthday celebration each time they use their custom favor. Each wine bottle stopper favor measures 3.75 x 1 inches and is made of silver metal with a black-rubber-gasket-wrapped conical base and a round metal disk top with an inset center - fit for easy application of the personalized label of your choice. From assorted color combinations, to seasonal and themed designs, to your own title, you design the eye catching label that suits your style! Each comes packaged in a clear topped box with a black base, finished with an attractive white organza bow, along with self sticking label sheets for you to apply. The wine stoppers were really nice! I didn\'t realize beforehand that they were stickers we applied to each stopper. They turned out great! Just a little more work than we thought.